Bigtimerz - Will Usher ever dance again after $6Million leg surgery? 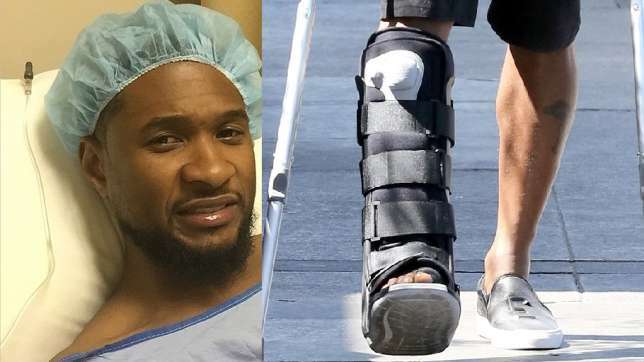 Usher was spotted for the first time since undergoing a 'Six Million Dollar Man' foot surgery over the weekend and the star didn't quite look better, faster or stronger. Wearing all black - including the telltale cumbersome cast – it was clear the OMG hit-maker was missing the lithe left leg that makes him one of the best dancers to have ever graced the charts. On Saturday, April 4, he posted some videos just before he was about to go under the knife, including one where he had claimed he was going to be rebuild 'better, faster, stronger' like the 'Six Million Dollar Man' from the 70s TV Show, though it may take a while. Well, from the look of things, his leg isn't healing as faster as he had thought and at this point we don't know when he will get back to the dance floor.